We internally manage our own approved supplier list and do not accept unsolicited sales communications from prospective suppliers (including recruitment agencies). Please do not contact us about paid staffing, marketing or other chargeable commercially provided "assistance" in relation to our events. Note that you will also find our numbers listed on the TPS and FPS lists and would like to take this opportunity to remind you of your obligations in relation to not engaging in marketing activity to those lists. We do not accept unsolicited email marketing either. Thank you for your understanding. The first Gender Summit held in Latin America has begun in Mexico City today. The Director General of National Council of Science and Technology of Mexico (CONACYT), the Summit hosts, Dr Enrique Cabrero Mendoza is included on the opening panel of the Summit. Read the list of over 60 eminent speakers on the GS8 website. P artners collaborating to bring the Summit platform to Mexico City include the Inter-American Development Bank, Natural Sciences and Engineering Research Council of Canada (NSERC), The National Science Foundation of the USA (NSF), Elsevier, the Fonds de recherche du Québec, The Association for Women in Science (AWIS), the L’Oréal-UNESCO For Women in Science program, Facultad Latinoamericana de Ciencias Sociales (FLACSO) Argentina and the UNITWIN/UNESCO Chairs Programme. GS8 is held under the theme Science without borders: Improving impact by interlinking gender, geographic, disciplinary and educational dimensions. 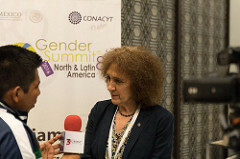 The day was preceded by a meeting of representatives of institutions of Science and Technology in Latin America at which 25 representative from 12 Latin America countries gatehred to plan the Gender Summit Latin America in the coming years. You can follow the live transmission of the event via Foro Consultivo Científico y Tecnológico A. C.
On 7th March, linked to the Next Einstein Forum, AIMS (African Institute of Mathematics Sciences) organized an African Women in Science (AWIS) workshop to identify priority actions to improve participation and advancement of African women in science, technology, engineering and mathematics (STEM) and invited Portia to facilitate the event. The workshop, organised by Karen Craggs-Milne, Director of Gender Equality, Inclusion and Business Development, built on scientific evidence and experience of similar actions in other regions. Specifically, it engaged important leaders and actors in adapting for African context the advice of science leaders in Europe subsequently reshaped by 600 participants attending the 3rd Gender Summit in Washington DC (led by the National Science Foundation) into the Roadmap for Action for North America. The expected outcome of the AIMS-AWIS workshop will be an outline of the Roadmap for Action for Africa, which will be developed, advanced and promoted through collaborations between AIMS, its partner organisations, as well as relevant stakeholders, in accordance to their needs and capacity to create change. Guiding this process was the AIMS-AWIS Expert Task Force, chaired by Dorothy Nyambi, AIMS Executive Vice-president, and the Advisory Committee of Leaders, led by Beatrice Njenga, Head of African Union’s Education Division. 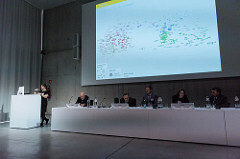 They reported on of the conclusions and recommendations from the Workshop at a plenary session at the Next Einstein Forum. Progress will be reported and promoted through future Gender Summits. Gender Summit founder, Dr Elizabeth Pollitzer, spoke today at an event hosted by South Africa’s National Research Foundation in advance of the Global Research Council meeting in New Delhi to discuss practical ways of applying gender lens to research. 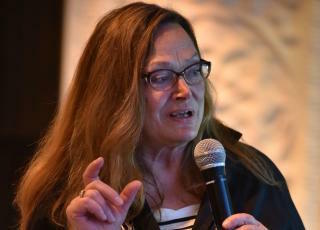 Elizabeth’s spoke about the recently published Gender Summit publication “The Role of Gender-based Innovations for the UN Sustainable Development Goals: Toward 2030: Better Science and Technology for All””. She examined how not only is the number of women in STEM an important factor for success in the implementation of the SDGs, but that a fuller consideration of gender dimension in research can improve quality of outcomes and generate valuable cross cutting benefits. For example, although road safety targets have been included in the SDGs, women are not identified as specific target even though women are 50% more likely to suffer injury in car accidents due to vehicle design and gendered patterns of use. More such examples have been identified by 27 international experts in the “The Role of Gender-based Innovations for the UN Sustainable Development Goals: Toward 2030: Better Science and Technology for All”report produced by Portia Ltd (Gender Summit founder) and WISET South Korea following the Gender Summit 6 Asia Pacific. Read more about the NRF event at the Next Einstein Forum’s press release about the event. Read the NRF press release about the event. The Korea Centre for Women in Science, Engineering and Technology (WISET) held a Gender- Forum today dedicated to exploring how to further the important recommendations of the recent GS report ““The Role of Gender-based Innovations for the UN Sustainable Development Goals: Toward 2030: Better Science and Technology for All”. The report was produced following the recommendation at the GS6AP to integrate gender considerations in science and technology across all 17 of the UN SDGs. Its contributors came from organisations such as the World Bank, Asian Development Bank, the International Monetary Fund, UNESCO, universities and development organisations in 10 countries. The Korean members included Dr Paik Hee Young of KOFWST, Dr Jang Yong Suk of STEPI and Green Technology Center Korea President Changmo Sung. The Gender-Forum was a vital platform to gather expert insight to define the possible challenges that lay ahead and gather concrete recommendations for actions that will help with the successful implementation of the recommendations. Read the full Gender-Forum report. Today saw the publication of a new report, produced comprising contributions of 27 experts, co-ordinated under managing editorship of Gender Summit founder, Portia, and GS6 Asia-Pacific lead partner, WISET that co-ordinated the. 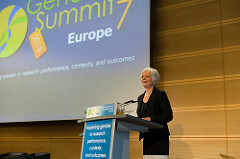 The report was inspired by the scientific evidence examined during the Gender Summit 6 Asia-Pacific, in Seoul on 26-28 August 2015, showing how research and innovation outcomes are influenced by biological and social differences between females and males, and by the growing scientific consensus to integrate gender as a dimension of quality and impact in research. Our aim in introducing this report is to help improve efficacy of the measures used to implement the SDGs, including their cross cutting impacts, by identifying research that investigates all sources and conditions of inequality in the lives of girls, boys, women, and men . Unbreakable Bonds, Issue 156 of International Innovation, features six insightful interviews with speakers from the Gender Summit 4: "Removing the Gender Bias" with Patricia Reilly, Cabinet of Commissioner Máire Geoghegan-Quinn, Research, Innovation and Science, European Commission; "A Female Perspective" with Daniela Corda PhD, Director, Institute of Protein Biochemistry (IBP), National Research Council of Italy (CNR), Italy; "Balancing the Gender Equation" with Karel Luyben PhD, President, Conference of European Schools for Advanced Engineering Education and Research (CESAER) and Rector Magnificus, Delft University of Technology, Netherlands; "Tapping the Talent Pool" with Paul Boyle PhD, Chief Executive, Economic and Social Research Council (ESRC), UK, President, Science Europe; "Engaging and Retaining Bright Minds" with Wanda Ward PhD, Director, Office of Integrative Activities, National Science Foundation (NSF), USA and; "Fair, Balanced and Flexible" with Shewly Choudhury PhD, Deputy Head of Basic Careers, Wellcome Trust, UK. Portia established the Gender Summits in 2011 as part of our genSET project. 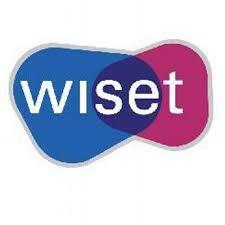 Just register on the International Innovation website to access all the content. Dr Pollitzer was interviewed by South African Broadcasting Corporation News about the first Gender Summit Africa, held on the the 27-28 April 2015 in Cape Town, South Africa. The Gender Summit platform was introduced to the continent by a partnership of regional research funders led by the Human Sciences Research Council (HSRC). Partners in South Africa included the Department of Science and Technology, the Department for Women, and the National Research Council, as well as Howard University, USA. The GS5 Africa was received with enthusiastic response from all the participants, who welcomed the idea of applying the gender lens to improve research and development outcomes and the idea that actions must be evidence-based and consensus-led. 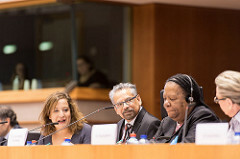 The event attracted energetic interest from South Africa’s media, with many speakers invited to take part in TV interviews and radio call-in programmes. Watch all the coverage on the GS5 About page.